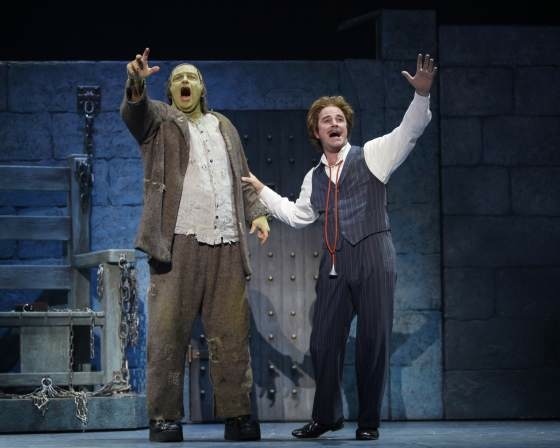 Last week, Toronto theatre got a little bit slapstick, a little bit silly and a lot of funny with the opening of Mirvish‘s Young Frankenstein at the Princess of Wales Theatre. Remember the 1974 Mel Brooks-Gene Wilder film collaboration of Young Frankenstein? I do, and I remember peeing in my pants laughing at the stuff as a kid, so I wasn’t sure that the story would be quite as funny now that I’m pushing thirty. My fears were unfounded. It could have easily turned out to be one giant, spoofy flop, but, the hilarity of the music, the talent of the cast and the show-stopping ensemble dancing all made this production come together. Much of the show’s success is owed to Roger Bart who plays Dr. Frederick Frankenstein, the lead character, with a subtlety and lightheartedness that forces you to go along for the ride. He’s downright believable as a world-renowned brain surgeon turned-slightly-mad scientist bent on bringing the dead back to life. Bart plays his role with a twinkle in his eye, and somehow, by the end of the show, that twinkle magically appears in the eyes of the audience, too. My date for the night said it was refreshing to see feel-good theatre that kept her giggling (which I think accounts for that eye-twinkle!). There is more to this show than indulgent sexual innuendos (“Roll in the Hay” is a particularly funny musical number fraught with sexual suggestion) and off-the-wall romps like “Puttin’ on the Ritz”, during which the Monster (Shuler Hensley), is all done up in a tux. At its heart, the story is really about accepting who you are and where you come from, which is the journey Dr. Frankenstein makes from the first scene to the finale. When we meet the doctor, he’s at the top of his game professionally, a well-respected dean of a medical school in New York City. He hails from a long line of brilliant scientists who all spent their lives creating live monsters from dead bodies. Dr. Frankenstein soon learns that his grandfather has passed away, and he is forced to travel to Transylvania to settle his grandfather’s estate, which consists of a spooky castle, a servant, Igor (charmingly played by Cory English) and Frau Blucher, the housekeeper (played with gusto by Joanna Glushak). When he arrives, Dr. Frankenstein rejects everything his family stands for – he even pronounces his last name differently than his Transylvanian ancestors. Of course, after a little while, he learns to make peace with the family trade, and he accepts exactly who he is. Young Frankenstein is full of laughs, and it has a positive message. By the end of the second act, you’re sort of ready for the end of the show, but you’re still chuckling. And that goes for all audience members; there were lots of kids in the audience when I was reviewing the play, and they were laughing just as hard – if not harder – than the adults in the house. As one of my friends said at intermission, “Sometimes it just feels good to laugh.” So grab some kids and hit Young Frankenstein before it’s too late.